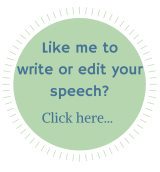 Sound advice for better speeches! Using a microphone is the perfect way to ensure your audience hears every word of your speech. If you've never used one before and don't know just what to look our for, things can all go horribly wrong! 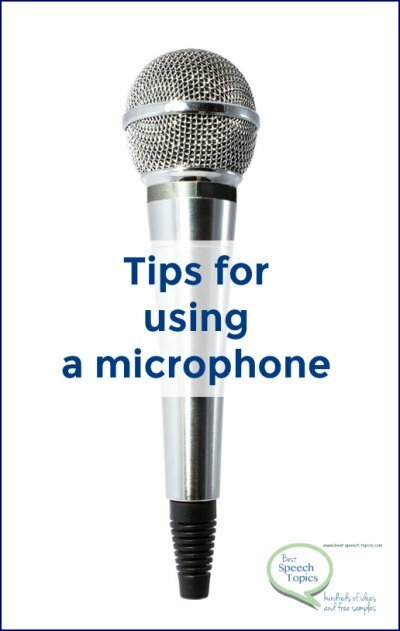 Here are some simple tips to make sure that using a microphone enhances your speech... rather than sabotages it! Get hold of a microphone in advance and PRACTICE. If you can practice in the venue you'll actually be using on the day, even better. Work on standing at just the right distance from the microphone. Ideally your mouth should be around 8 to 10 inches away. Too close, and your audience will be able to hear your every breath (and possibly the odd anxious gulp, too). Too far away and they won't hear you at all! Ask a friend to watch (and listen) then give feedback on your microphone technique. Ask them to sit in various parts of the room - including the very back - to see how you're coming across. If you don't have a friend available, then record yourself and look out for any potential issues. Remember to use plenty of expression and variation in your tone, just as you would without the microphone. Don't try to put on a special voice - be natural and be yourself. Even if you've managed to get in some practice beforehand, it's still a good idea to do a quick sound check on the day (if possible). This will highlight any problems before you get started. This sounds obvious, but so often gets overlooked. Make sure you know how your microphone works. In most situations, it will be set up and ready to go. But just in case it's not - or if you accidentally mute yourself mid-speech! - it's good to know exactly how to make yourself heard again. In the same vein, find out ahead of time the style of microphone you'll be using. In some situations, you may be given a microphone that attaches to your clothing (a lavalier mic). If so, wear something suitable (ie a jacket with a lapel, a top that buttons up at the front, or something with a collar). If the mic is wireless, you will also need to wear the transmitter for it, ideally in a back pocket. A lapel-type microphone will pick up sounds from your clothing, so make sure there are no buttons or jewelry that will knock against it, or that your hair won't brush over it when you move. Hand-held microphones are less common for speeches, but if you DO use one, don't move your hand around too much on the mic itself. This is because it will amplify the handling noise, drowning out your words. Ever heard the ear-splitting screech of microphone feedback? Too much of that, and your speech will be remembered for all the WRONG reasons. 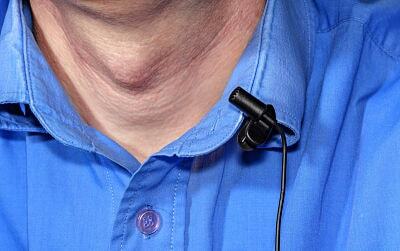 To avoid it, keep your distance from the mic and adjust it by bending the neck, NOT by touching the mic itself. TURN OFF YOUR CELL PHONE. Aside from risk of your Justin Bieber ringtone accidentally being broadcast across the room, cell phone signals can interfere with audio equipment and cause feedback. If you have any of your own tips for using a microphone - or any embarrassing microphone stories you'd love to share! - please don't hesitate to contact me. I'd love to hear from you.